NEW YORK—An important idea put forth at the Learfield Intercollegiate Athletics Forum (IAF) is that the overall well-being of a college or university and its student-athletes requires an alliance between the board of trustees, the president and the athletic director. Each December, various stakeholders in the world of intercollegiate athletics gather at the IAF to discuss pressing issues in college sports. Sessions range from one-on-one interviews with conference commissioners to a panel that includes student-athletes. On Wednesday afternoon, Glenn Wong, distinguished professor of practice (sports law) at the Sandra Day O’Connor College of Law at Arizona State University, moderated the session “From the Office of the President: Upholding the Integrity and Ideals of Intercollegiate Athletics” featuring Dr. Renu Khator, chancellor of the University of Houston System and president of the University of Houston, and Dr. Scott Cowen, president emeritus of Tulane University. 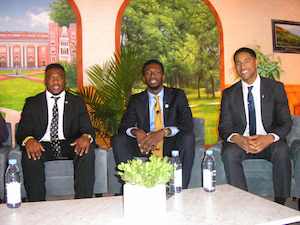 They discussed their experiences and thoughts on the current state of college sports. Cowen and Khator said that there must be alignment between the board, the president and the athletic director of an institution in order to make sound decisions in the best interest of student-athletes, athletic programs and the institution as a whole. 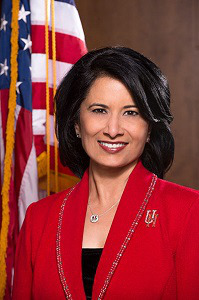 Khator said that she regularly engages with the athletic department on campus, including meeting with the faculty athletic representative, and the compliance officer. Cowen noted that some boards can become caught up in being cheerleaders for athletics, rather than fulfilling their responsibilities to make sound decisions. When that happens, it erodes trust and respect. The president has to champion the idea of what board oversight means. The members of Khator’s board are appointed by the governor of Texas. All board members undergo thorough orientation, which includes a conflict of interest policy and annually signing a statement about their responsibility for athletics. In 2017, University of Houston undertook a $1 billion capital campaign. Khator said most major donors want to talk about football. She’s happy to do so, but then is unfazed about directing the conversation to the funds needed for a program such as creative writing. Both Cowen and Khator discussed inequities in intercollegiate athletics. Cowen spoke of time where Tulane had its football team complete an undefeated season, but not be invited to any major bowl games. Such exclusion negatively impacts not only the football program, but also the athletic department as a whole and overall student engagement. Noah Knight, a former basketball player at the University of Missouri-Kansas City and chair of the Division I Student-Athlete Advisory Committee of the NCAA, said he thinks the recruiting process should include more specific details about the amount of time that goes into practice, workouts, study hall and other aspects of being a student-athlete. All six panelists admitted that certain stigmas follow student-athletes and have taken it upon themselves to dispel those stereotypes. Some it is as simple as talking to other students in their classes. Michael Nzei, a basketball player at Seton Hall University and a member of the Big East All-Academic Team, makes it a point to do that and said he also joined a student organization. Day two of IAF included a featured interview with Dr. Katrice Albert, executive vice president of Inclusion and Human Resources at the NCAA. Albert has traveled extensively during her first year in this position, to engage directly with presidents, athletic directors and student-athletes. Albert’s position combines the areas of diversity and inclusion with Human Resources, a first for the NCAA. The goal, she said, is to make inclusion a central point in the hiring and retention of staff. “I want us to understand there’s a thinking that women and people of color don’t rise to the level of the best because they’re not from the same milieu,” said Albert. Albert said White men who took a chance on her even when it wasn’t easy to do so, are a vital part of her career trajectory. Building champions for diversity is central to her mission. She challenged conference attendees to be proactive and move the needle forward.